I'm not sure why this happens, but one way to solve your issue is to go into your build settings and defining the Framework Search Paths to a folder which contains the frameworks in question. If the frameworks are placed in your project directory, simply set the framework search path to $(SRCROOT) and set it to recursive. But I don't understand, because the module is in my project, declared in "Linked frameworks and Libraries" and in "Embedded Binaries". The frameworks is in Objective-C, so I wrote a Bridge Header for it. Please, how can I make Xcode recognize the framework? Make sure that you tried simply skipping import of the framework as it is already added with the bridging header. Make sure that the naming of you configurations in the sub projects matches that of the "parent" project. If the configuration naming don't match exactly (case-sensitive), Xcode will abort the archive process and show the error "No such module ..."
That is, if you have a "parent" project with a configuration named "AppStore" you must make sure that all subprojects also have this configuration name. I was experiencing this problem as well. The fix for me was that the Archive schemes between the two projects didn't match. I have an xcworkspace with a framework project and an app project. The problem was that in the Archive scheme for my app, I was using a different Build Configuration than the framework was using for it's Archive scheme. I set both Build Configurations to Release, and that fixed the issue. In my case, after many attempts to figure out what I was doing wrong importing a framework I eventually discovered that the framework itself was the problem. If you are not getting your framework from a trusted source you should inspect the framework and ensure that it contains a Modules folder with a module.modulemap file inside it. If module.modulemap is not present, you will get the "No such module 'MyFramework'" error. 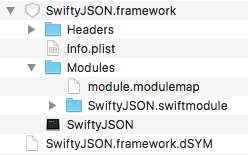 If the Modules folder is missing the "MyFramework.swiftmodule" folder then the framework will be found but Xcode won't know about its contents so you will get different errors. The error is "module not found"
In TestProject-Bridging-Header.h file, write #import "Mixpanel/Mixpanel.h"
If you're building for a platform like tvOS, make sure you have an Apple TV (i.e. matching) simulator selected. Building a tvOS app with an iOS simulator selected gave me exactly this error. Spent the better part of an hour looking for all sorts of build issues... doh. But then noticed that I was not adding pod to the main target section but only adding to Test and TestUI targets in Podfile. So, need to make sure that one adds pods to any appropriate placeholder. Open .xcworkspace and build again. I found that the Import Paths in the Build Settings was wrong for a custom (MySQL) module. After pointing that to the right direction the message was gone. Just for completing with another possibility, this error might happen when the option "Find Implicit Dependencies" is unchecked. Go to Edit Scheme -> Build. I was getting this issue because I set the wrong target in the podfile (the project itself rather than the UITests section). 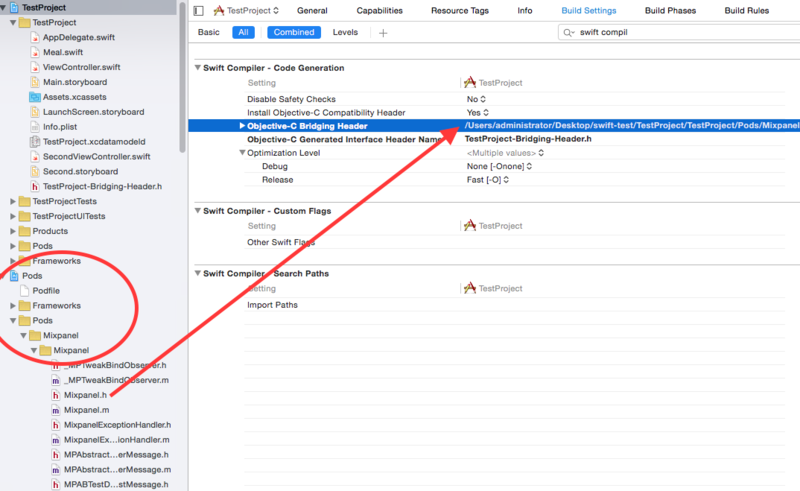 IF you have done everything above and still nothing worked for you then try adding $(inherited) in Framework search path of your target's build setting.